Celebrate springtime with freshly handmade, authentic Santa Rosa tapers, votives and pillar candles. 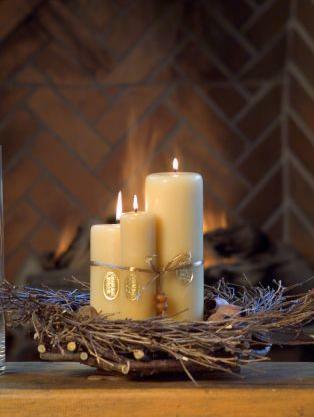 Santa Rosa Candles have established a loyal following among designers, and they are a great value. Cottage Catalog and Santa Rosa Candles have been featured in Martha Stewart Living. If you can use a good gift idea, take a look at our tapers and votives, or one of our most popular items - a trio of Santa Rosa Candles that comes in a gift box, tied with beautiful Midori organdy ribbon. It's ready for gift-giving. We love to bring you good value and creative inspirations for your home. We support artists and their work that reflects the hand of the artist. We appreciate your business. We hope you enjoy browsing, and may you find something you'll love. One more thing - we ship promptly! Thanks so much for visiting. Please come back again soon. Denotes a Cottage Catalog exclusive item. Looking for a special gift? Let us know -- we would love to help you make a selection that is sure to please. All catalog items are handmade and subject to availability. We support artists and their work that reflects the hand of the artist.